Rare black and white memorial picture attrib. to the school of Mary Balch, Providence, Rhode Island; silk thread and ink on silk. 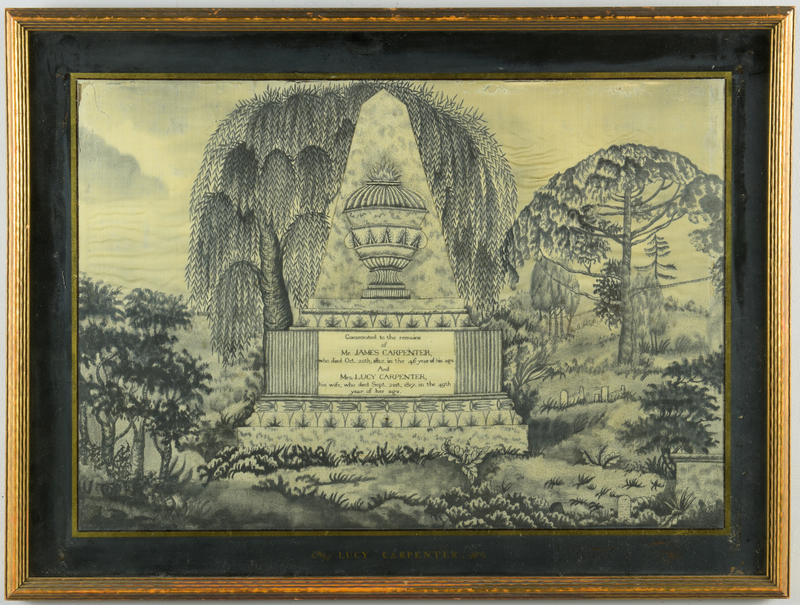 The scene, likely worked by a schoolgirl mourning her parents, depicts a graveyard with weeping willow overlooking tombstones and a central urn set against a marbelized obelisk, the plinth base embroidered in fine silk thread "Consecrated to the remains of Mr. James Carpenter, who died Oct. 20th, 1812, in the 46 year of his age / And / Mrs. Lucy Carpenter, his wife, who died Sept. 21st, 1817 in the 49th year of her age." 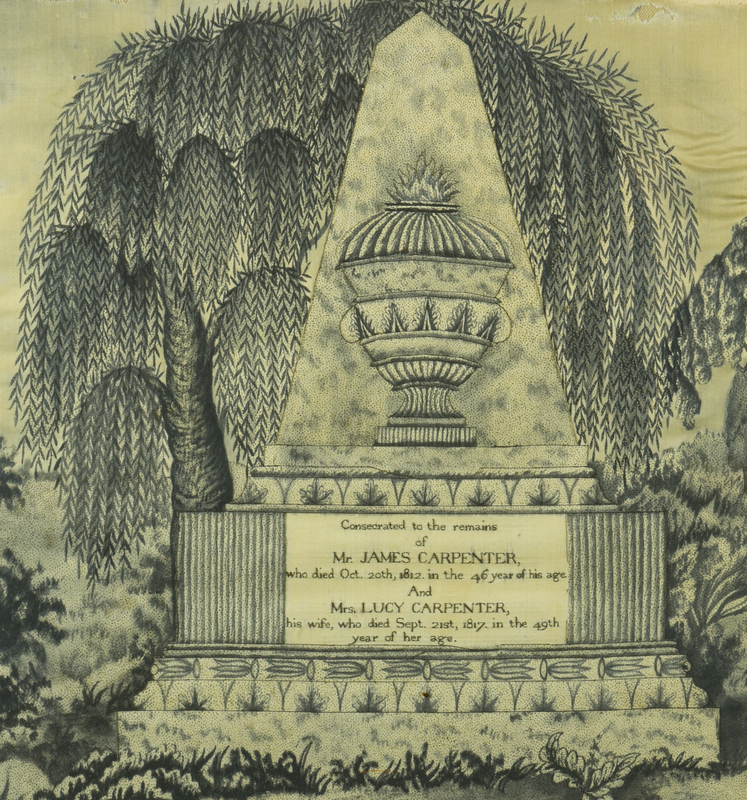 Eglomise mat with gold lettering "Lucy Carpenter." 15" x 21 1/2" sight, 20" x 26" in molded giltwood frame. 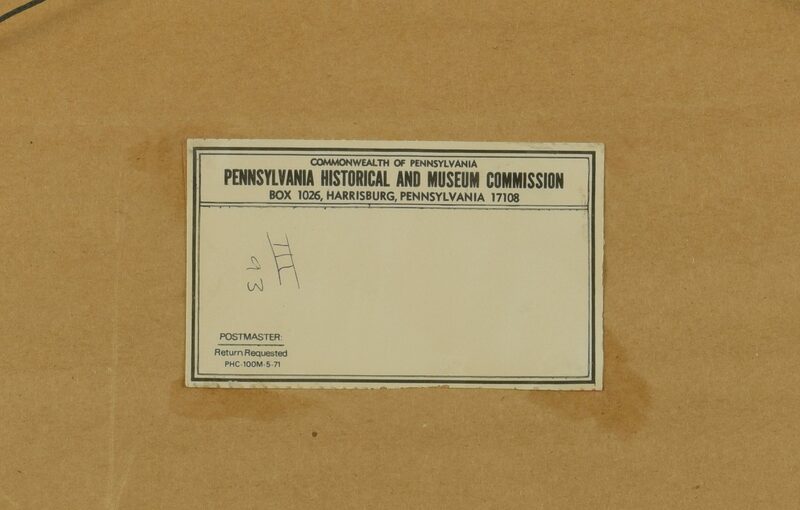 En verso is a label for the Pennsylvania Historical and Museum Commission and apparent accession number 49.841. 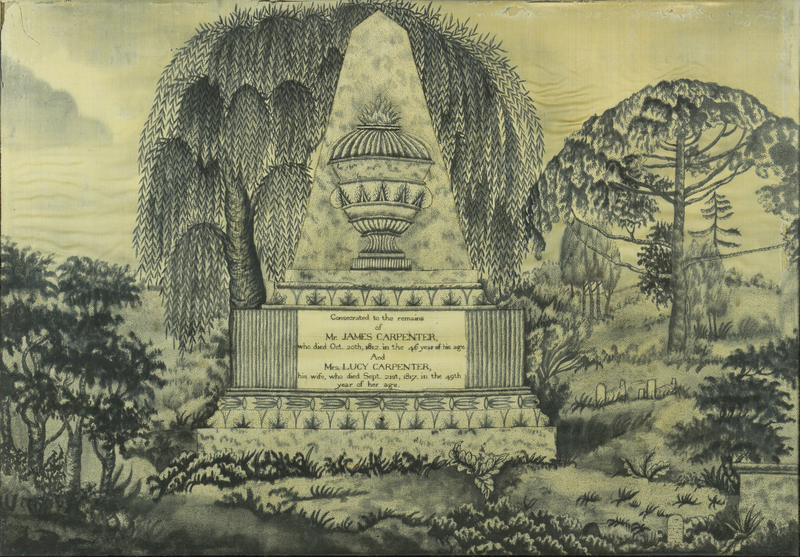 Note: another needlework picture attributed to Lucy Carpenter memorializing her father and two sisters, apparently worked prior to this piece and to the death of her mother, is in the collection of Old Sturbridge Village and may be viewed on their website. 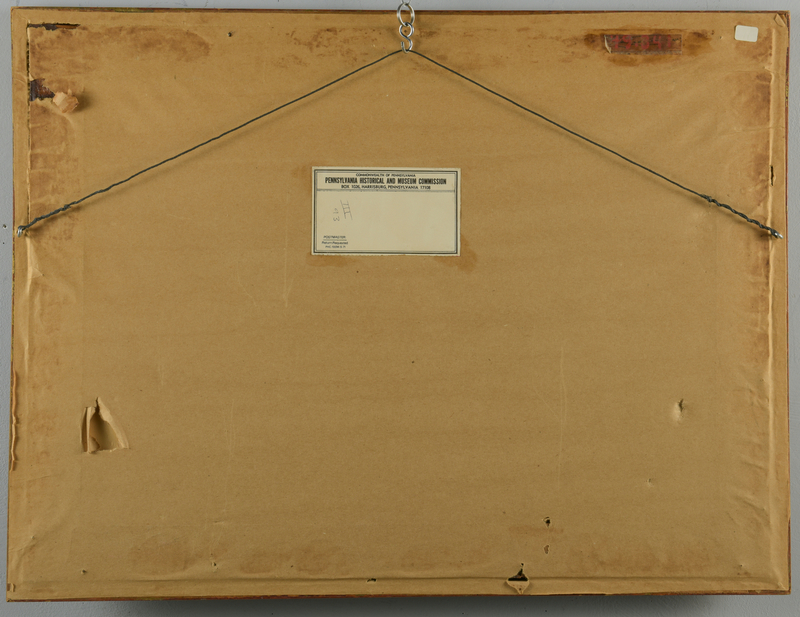 (That work has the label of "Looking Glass and Picture Frame Manufacturers" Peter Grinnel & Son of Providence). The Sturbridge entry on that piece references this work and its prior sale in January, 1974 as part of the Garlusch Sale #3595, lot 131, Sotheby Parke Bernet Inc., New York. For a similar example from the Mary Balch School, ref. 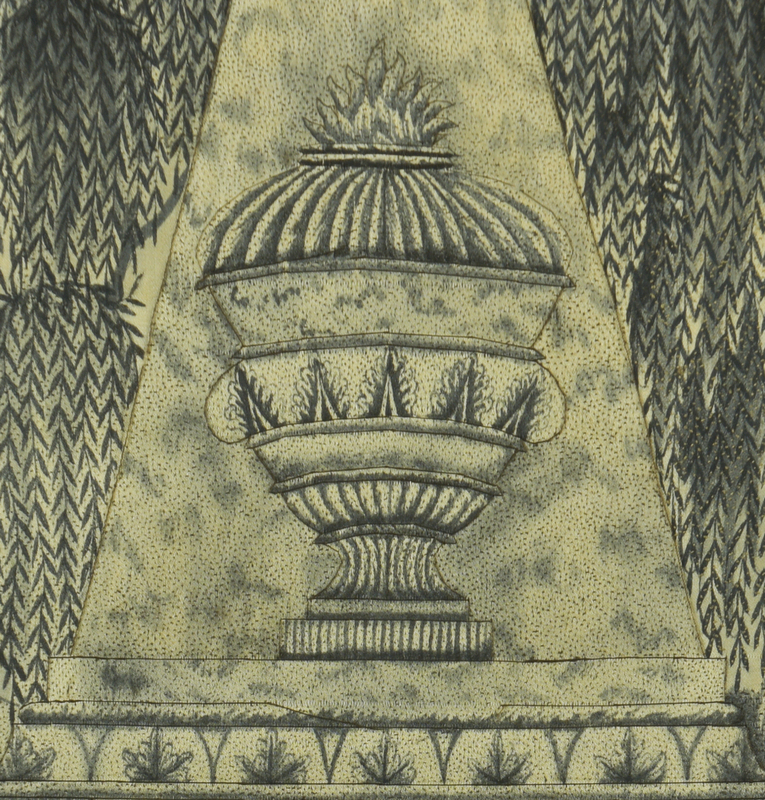 the Andrews Family Mourning Piece c. 1810, exhibited at the American Folk Art Museum, "White on White And a Little Gray," March 28-Sept. 17, 2006. http://folkartmuseum.org/exhibitions/white-on-white-and-a-little-gray . 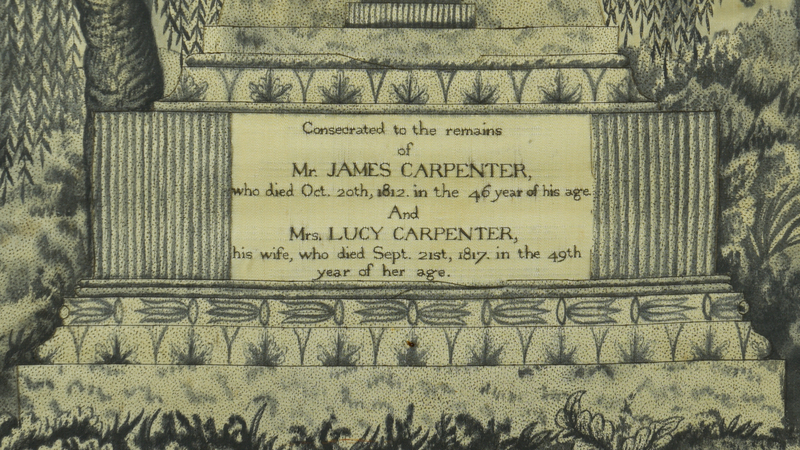 Provenance: Lucy Carpenter was born 1794 in Rehoboth, Massachusetts, to Lucy Bliss Carpenter and James Carpenter, who descended from the town's earliest settlers. Private Nashville collection. CONDITION: Frame appears later. Not examined out of frame. Fraying with narrow losses along top edge and some rippling and light discoloration to silk at upper half, oxidation to mat. Glass appears original. 2" L thread break to center area just below urn. 1" area of narrow loss to right edge of silk.